State of Grace have some of the best traditional Japanese tattooers working today. There’s no reason to expand on this point, because it’s really irrefutable. Just look at their portfolios and news/press section. Hard to touch that. The shop is located in San Jose’s Japantown. It’s a small little area at just a few blocks in any direction, but when you’re in those few blocks, there is a different vibe than anywhere else in the city. It just seems a little bit more serene. You enter the shop to stairs and the familiar smells and sounds of any other tattoo shop, but atop the stairs something a just a little bit different… it’s a huge open studio with traditional Japanese art adorning the walls. There are two separate areas for Horitomo and Horiken to work in their traditional style of tebori. A glass case is filled with books that they’ve published and sell, along with clothing and whatever other merchandise they might have at the time. They’re usually pretty busy, so it’s important to stay patient until someone can help you… especially if you’re not a familiar face. Patience is pretty easy with their portfolios at your fingertips… definitely a lot of great art to enjoy. I’ve only been tattooed by Jill, Horitomo, and Horitaka and I really can say that each experience can be completely different. 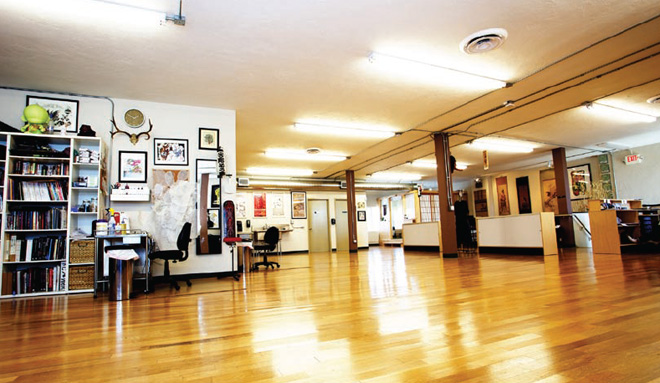 The vibe and chemistry of the shop can change, depending on who’s working and who you’re getting tattooed by. There are quiet spiritual moments and there are hilarious random tattoo shop conversation moments. Either way, never a bad experience. The books. Damn… what can you say?! SOG has got to put out some of the best books out there. Check out their site. Buy the books. Read them. Look a the pictures. Read them again. I haven’t gone to many other conventions myself, but most of the others that I have gone to pale in comparison. They concentrate on the tattooers and tattooing… not necessarily entertaining the crowd. Some of the best in the world support it and I look forward to it every year. Overall, State of Grace is world renowned. They’re in touch with the local neighborhood community and the tattoo community worldwide. Aside from the resident artists, there’s a good chance you can catch other top notch artists doing guest spots there as well. One of the best and most important shops open in this day and age!! Beautiful shop, amazing artists, cute french bulldogs!